“The trail brings a lot of economic benefit to the town — [Tourists] come to do the Creeper, then come in to do other things in town." Bicycling 68 miles in a day would be an accomplishment for most people. But doing it nearly every day is a testament to endurance and willpower. At 81 years of age, it seems an impossibility. Meet Lawrence the Legend. On any day of the week, you're likely to see Lawrence Dye, a slender man with big glasses, pedaling along the Virginia Creeper National Recreation Trail on a bike that he says has been "a great friend." Often dressed in bright yellow, Dye is hard to miss. He's traveled the trail's length—34 miles—roundtrip several times a week for more than 20 years, racking up over 175,000 miles. "The trail is a huge part of Lawrence's life," says Beth Merz, area ranger for Mount Rogers National Recreation Area, a portion of which the trail runs through. "He's one of those folks that actually goes up the mountain." The mountain Merz is referring to is Whitetop, part of the Blue Ridge range in southwestern Virginia. At nearly 3,600 feet, it's the high point of the Virginia Creeper National Recreation Trail and is thought to be the genesis of the Virginia Creeper nickname for the railroad, because the trains had to creep up the slope. The moniker was also a nod to the vine of the same name prevalent in the region. "The train climbed up the shoulder of Whitetop Mountain," says Wayne Miller, president of the Virginia Creeper Trail Club. "There are stories about its slowness. As it climbed up that steep grade, you could almost get out and walk alongside it." To avoid the challenging climb, many visitors to the rail-trail park at Damascus, a lower point on the trail, ferry their bicycles on a shuttle up to Whitetop Station (a replica depot and visitor center) and coast back down to their cars. The trail continues on to Abingdon, but this 17-mile eastern leg, managed by the U.S. Forest Service, is one of its most popular sections. "I think the main reason they come in the numbers that they do is because it's pretty simple," says Kevin Costello, director of tourism for the Abingdon Convention and Visitors Bureau. "There are eight outfitters to choose from that take visitors up to Whitetop. It's the user-friendliness that makes it so popular." The Virginia Creeper – officially Norfolk & Western (N&W) Railway – extracted resources, primarily lumber, out of the region in the early 1900s. It also carried iron ore, passengers, and mail. Three miles west of Whitetop lies a remnant of this railroad era. "Green Cove is the real deal," says Merz. "It's the oldest station on the trail and was the center of the community. Green Cove Station was a post office, general store, and cargo location. There are artifacts on display — like the original mail boxes — and it frequently features photography exhibits or live music from local groups. It's quite an attraction." The trail is heavily used from Memorial Day to Labor Day, but the variety of leafy trees along it — maple, birch, oak, beech, and poplars — wow visitors in the fall and push the trail's peak usage to October. At its midpoint is Damascus, aptly nicknamed "Trail Town, USA" for its convergence of several trails, including the Creeper. The famed Appalachian Trail, stretching more than 2,000 miles from Georgia to Maine, runs down Main Street. Last year, Budget Travel named it one of the "Coolest Small Towns in America," specifically citing the community's welcoming trail culture. "Damascus is a little mill town that was saved by the trail," says Miller. "It was on its last legs. The old industries were shutting down. Now it supports eight bike shops that service the trail." This month, the town of less than a thousand is about to get a whole lot bigger. Trail Days is coming, and with it a twentyfold increase in the town's population. "Trail Days is centered around the Appalachian Trail," says Aaron Sizemore, Damascus town manager. "Lots of catching up goes on during Trail Days. It's a reunion for hikers past and present. The first part of week, they trickle in. By Wednesday, they're coming from out of town, bringing tents, and the town is packed; around 20,000 come." This time of year is also one of the prettiest. "In the spring, you'll see mountain laurel and rhododendron blooming along the trail," says Merz. "Down below trestle number 21, you're just riding through white and pink beds. The mountain laurels are thick along there." In contrast to its heavily wooded eastern end, the section between Damascus and Abingdon is much more open and pastoral. Here, the trail flattens out, breaking from the wilderness into farmland and more populated areas. Long ago, Abingdon was known by a different name. The story goes that when famous frontiersman Daniel Boone hunted here in the fall of 1760, a pack of wolves came out of their lair and attacked his dogs. He named the area Wolf Hills, which stuck until Black's Fort was built in 1774. Today, Costello calls Abington "a touristy town" and rightly so; the town is rich with attractions, including Barter Theater, one of the longest running theaters in the country; Martha Washington Inn, a women's college in the 1850s and later a Civil War hospital; and a 20-block historic district. Mollie, an N&W steam engine dating back to 1907, sits adjacent to the Creeper trailhead on a small band of track. Her smaller-than-standard size made her more nimble for the railroad's steep terrain, sharp curves, and wooden trestles that couldn't support a heavier engine's weight. And the work of O. Winston Link, who captured classic images of the N&W trains in the 1950s, is on display in the Abingdon station. One of the biggest draws is the rail-trail itself, which ends just south of Main Street near the center of town. "The trail brings a lot of economic benefit to the town," says Kevin Worley, director of Abingdon's parks and recreation department. "We average 250,000 annually using the trail. It's a popular destination point. They come to do the Creeper, then come in to do other things in town." The trail is also the catalyst for a new way of thinking. "We have a new urban pathway project to connect sidewalks and create linkages that steer more people to the trail," says Costello. "People are embracing being able to ride a bike more often. The trail has inspired that type of philosophy in town." But it wasn't always this beloved. When it was first suggested that a trail be built in the railroad's place, adjacent landowners put up a fight. It was 1977, the year the trains stopped running. Inspired by the burgeoning rail-trail movement, Dave Brillhart and French Moore, Jr., members of the Washington County Planning Commission at the time, proposed the idea. "When word got out that we were wanting to make a trail out of it, well, all these people that lived out there, they were just furious with me and anybody who talked about it," recalls Moore in a 2009 interview. "They were so mad about it." At first, opponents put baled hay, downed trees, and locked gates across the trail to block its use. One of its trestles was even burned. "People thought: 'We don't want trashy people in our backyard,'" says Miller. "Once the trail was declared nonmotorized, they realized that responsible people were using it and the trail could bring in sustainable tourism. Slowly people came around." "The trail is our economic engine," says Sizemore. "It's the biggest one we've got. It's the thing that keeps us going." 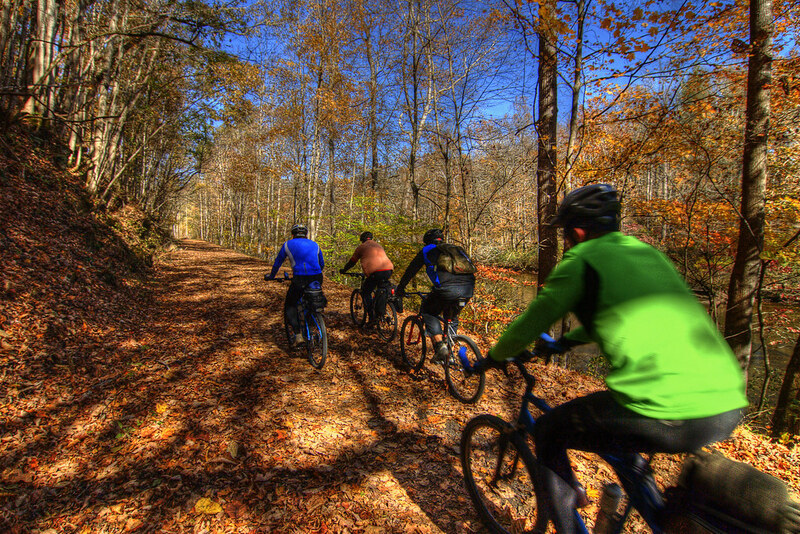 Many regional events, which boost tourism in the area, feature trail activities. Coming up in early August, the weeklong Virginia Highlands Festival, celebrating Appalachian arts and crafts, offers a chance to meet the soft-spoken and beloved local celebrity Lawrence Dye in the annual Ride with the Legend outing on the Virginia Creeper Trail. When asked what his favorite part of the trail is, Dye responds, "I love all of it. The trail is just a beautiful place to be." Uses: Primary uses are bicycling (hybrid or mountain bikes are recommended), walking, and horseback riding. The trail also runs along Whitetop Laurel Creek, a popular coldwater stream for fly fishing. Although the trail is open year-round, its visitor centers are only staffed May through October. Cross-country skiing is permitted, but the snow often isn't deep enough to be suitable for this activity and the trail's 47 trestles make for slippery crossings in the winter. Difficulty: Easy to moderate. Note that there are some road crossings along the route, so trail-users should use caution at these points. Grade: At nearly 3,600 feet, Whitetop Station, the trail's eastern terminus, is its high point. Westward from there to the trail's midpoint at Damascus, is an easy downhill ride. Riding in the reverse direction would be a challenging uphill climb for inexperienced riders, so many visitors park in Damascus, take one of the numerous shuttle services up to Whitetop Station, and then ride down to their cars. Exploring the western half of the trail continues to be a downhill ride from Damascus to Alvarado, which sits at about 1,900 feet. A slightly uphill ride from Alvarado to Abingdon brings visitors to the trail's end. Getting there: Tri-Cities Regional Airport in Blountville, Tenn., is about 30 miles from the trail's western terminus in Abingdon. Roanoke Regional Airport, approximately 130 miles away, is another option. Access and parking: The Forest Service staffs two visitor centers along the Virginia Creeper Trail Friday through Monday from Memorial Day through October: Whitetop Station (Whitetop Gap Road, Whitetop) and Green Cove Station (41221 County Road 600, Damascus). Information about additional trailheads along the route is provided on the Virginia Creeper Trail Club website. Rentals: Several outfitters provide bicycle rentals and shuttle service for the trail. A list of providers is available on the Virginia Creeper Trail Club website.